Sonoma County is medium-sized county on the northern California coast. The county has a very strange political history. It started as one of the original 27 counties in 1850, but was then just a tiny slice of interior Coast Range territory with its county seat at the town of Sonoma. Much of this original jurisdiction is today's Sonoma wine country. The county borders expanded to the coast in 1855 and then expanded again in 1859 when Mendocino County was finally organized. Sonoma may be the only county to get substantially larger over its history. Today it has a wide variety of habitats from rocky shores to coniferous forests, and from sandy beaches to redwood canyons. Bodega Bay is a major feature along the coast, with its tidal bay full of waders and waterfowl in migration and winter. There are also well-known passerine vagrants traps along the bay. A fishing fleet resides here, and thus Bodega Bay is often used by birders for pelagic trips to Cordell Banks and other points offshore. County birding statistics and links are on Joe Morlan's site. A nice introduction to Bodega Bay birding in on the Madrone Audubon site. 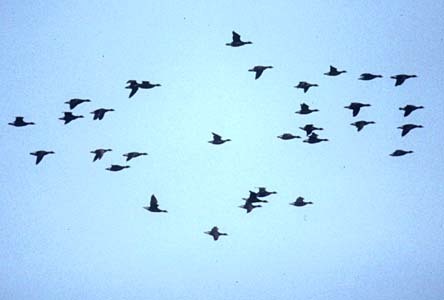 A Breeding Bird Atlas has been completed and published (Burridge 1995). 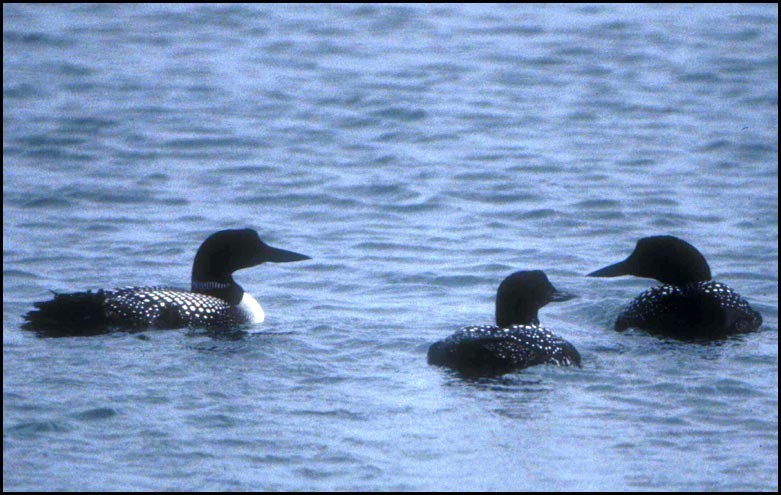 For Sonoma County the headline photo shows three alternate plumaged Common Loons floating on Bodega Bay. Bodega Bay was the first coastal birding spot I ever visited, and I was just so amazed at the amount of birdlife there. 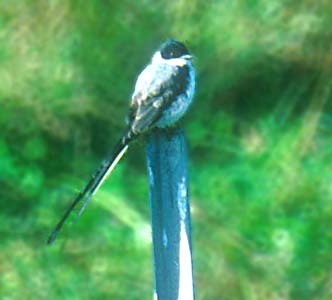 It remains one of the top birding spots in the State. I actually spent four years in a private boarding high school in this county (near Healdsburg) and did a lot of birding here, but that was before I had a camera with a long lens. My collection of Sonoma photos proves to be meager. Here is a marginal shot of the rarest bird to ever reach the county — a Fork-tailed Flycatcher at the Russian River mouth in September 1992 (below left; my shot 5 Sep 1992) — and a flight of Brant over Bodega Bay (below right; 26 Apr 1986).